Now, you can get a close-up view of the interior workings of the Santisima Trinidad, Spain’s largest battleship at the time of the Battle of Trafalgar. 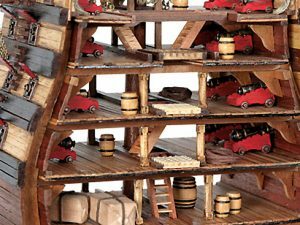 In many ways more interesting than the full hulled model, the cross section takes less time to build and less space to display. 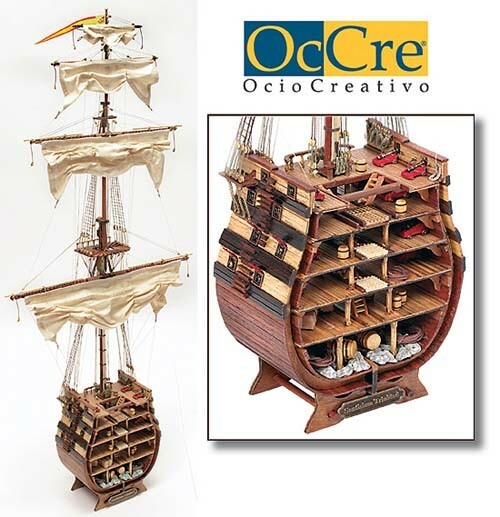 OcCre’s Santisima Trinidad kit is packed with high quality materials and authentic detail. Wooden parts are laser cut. Hull planking is done in light beechwood and rich African walnut. Decks are also covered with individual planking strips. 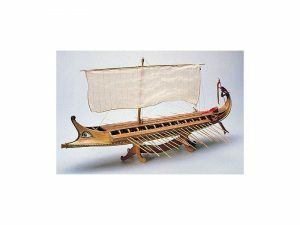 A rich array of fittings includes wooden grating, blocks and deadeyes, carved wooden barrels, brass eyebolts, belaying pins, nails and chain, metal hoops, cleats and gun-ports. 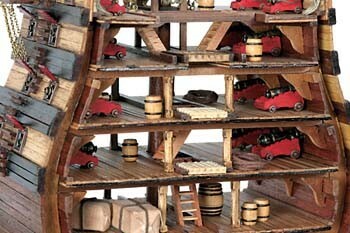 No detail has been overlooked – you’ll even get scale ballast! 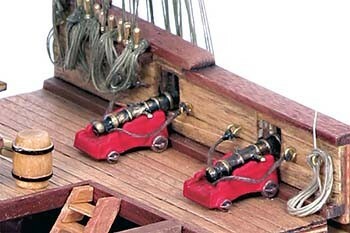 Fourteen brass cannon on burnished metal carriages replicate original armament. 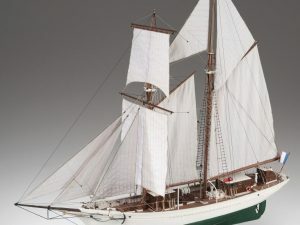 Four diameters of rigging line, pre-sewn and ready-to-mount sails, silk-screened pennants, wooden display base and pedestals complete the kit. 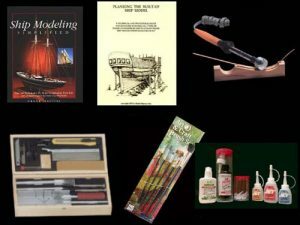 Full sized plans feature 2-color rig plan. A booklet of over 100 color photos accompanies clearly written assembly instructions. The Spanish ship Santa­sima Trinidad (officially named Santisima Trinidad y Nuestra SeÃ±ora del Buen Fin) was a first-rate ship of the line of 120 guns (when first built). Her armament was later increased to as many as 144 guns on four decks. For many years she was the biggest warship in the world. She was built at Havana, Cuba, to a design by Irish naval architect Matthew Mullan and launched in 1769 as an 120-gun three-decker (some sources say 116 or 112 guns). For many years she was the biggest warship in the world, being considerably larger than her British contemporary Victory and somewhat bigger than the French Bretagne. There is no complete plan of the ship in existence, but there are of the 112-gun ship from 1765, which might be found the original dimensions of the ship : (the next dimension are in feet of the burgos (278,6 mm), and metres.) length = 213 2/3 (59,53), keel= 182 5/12 (50,82), beam= 57 3/4 (16,09), depth= 28 11/12 (8,06). For exact figures, and those in the General Characteristics frame, see: JosÃ© Cayuela Fernandez – Trafalgar, hombres y naves entre dos Ã©pocas – Ariel 2004. 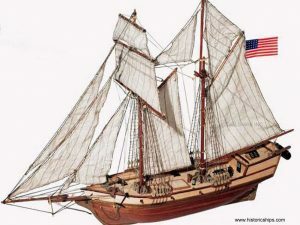 In 1795, her forecastle was joined to her quarterdeck to create a fourth deck containing a battery of eight pounder guns, giving her a total of 144 guns. Her armament seems to have been quickly reduced to 130 to 136 guns. Even so, she now carried the largest number of guns of any single ship of her time. As the only ship with four gun decks, she was reputed to be the largest warship in the world, although she had actually been surpassed in sheer size by the new French 120-gun ships such as the OcÃ©an and Orient. 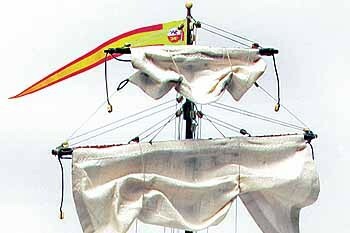 The additional weight of guns so high above her waterline made her sail poorly, leading to her nickname, El Poderoso. SantÃ­sima Trinidad remains famous as the only four-decker ship of the line ever built; although the British designed one, Duke of Kent, they never built her. In July 1779, Spain declared war on Great Britain, joining France in support of the American colonists in the American War of Independence. SantÃ­sima Trinidad became the flagship of the Spanish fleet, taking part in the Franco-Spanish operations in the English Channel in the late summer of that year. In 1797, she was the flagship of Teniente General JosÃ© de CÃ³rdoba, the Spanish commander, at Battle of Cape St Vincent on 14 February 1797, where she was badly damaged and nearly captured by the British fleet. She was first in action with the British ship Captain, 74, commanded by Commodore Nelson, and Culloden, 74. She was then attacked by the Blenheim, 90, Orion, 74, Irresistible, 74 and Excellent, 74. 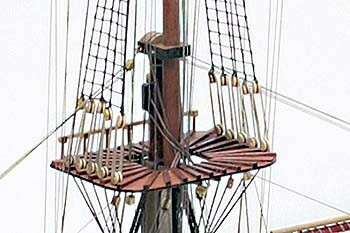 By now she was severely damaged, having lost all her masts and with half of her crew killed or wounded. She struck her colors (surrendered), but the British failed to take possession and she was saved by the Pelayo, 74 and Principe de Asturias, 112. 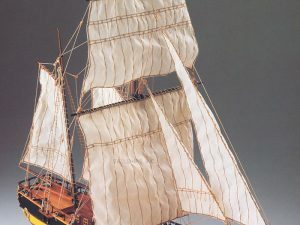 Several days later, SantÃ­sima Trinidad was spotted, still damaged, making her way back to Spain, and engaged by the frigate Terpsichore, 32, but she escaped. She eventually returned to Cadiz for repairs.